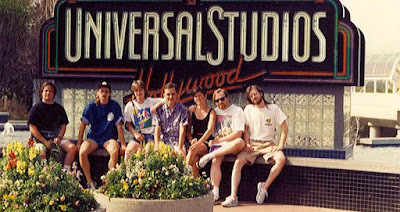 Members of the University of Alberta Star Trek Club at Universal Studios Hollywood, February 27, 1992. Yesterday, the Academy of Motion Picture Arts and Sciences announced that the field of Best Picture nominees would double in size from five to ten nominees each year. While this looks like a decision founded more on business needs than artistic ones, I'm thrilled nonetheless. As a movie fan, I've long used Best Picture/Screenplay/Director lists to seek out worthwhile new films, and this will widen the pool of recommendations. From the early 1930s to the early 1940s, the Academy nominated between eight to ten films for the Best Picture award each year, so this isn't exactly something new. Had this policy been in place last year, surely The Dark Knight would have been one of the extra five pictures nominated, and who knows which films could be added to the expanded list this year? Transformers 2 may get a nod...oh, sorry, the list will only be ten films long, not one hundred. 2009 probably won't be another 1939 as far as quality movies go, but the Academy's decision to recognize more films as Oscar-worthy at least opens the door for more great movies to get some deserved recognition and exposure. I hope they stick with this decision for many years to come. I hate these stretches when I'm too busy, stressed or tired to write something properly meaty and inspiring. I see other bloggers who churn out good, insightful stuff each and every day, and then I look at my own erratic output and sigh. Still, I've managed to at least choose and correct the photos for the next installment of Journey to the Edge of Nowhere, which I must finish before heading back to Leaf Rapids in late July. Most of the political bloggers I follow have been writing about the foot-in-mouth disease outbreak among provincial Tories, but in all honesty I expect PCs to say these kinds of things; they call themselves conservative, so it follows that many (indeed, most) in their party will be socially conservative, right? This is who they are. I don't agree with their viewpoint and I think their musings in recent days have the potential to do harm (if indirect) to women, girls and minorities, but at least Evans and Elniski were honest about their point of view. At least they're giving people a firm basis to endorse or reject their beliefs at the ballot box next time around. Edited to add: Video found on YouTube via Twitter. I've meant to do this for a while, but now you can finally read some of my favourite posts - including movie and book reviews, essays and commentary on pop culture, and other silliness - by following the links under "Earl's Greatest Hits" at right. Hope you find something to enjoy. In the comments of my last blog post, Jeff Shyluk makes an oblique reference to an answering machine message I created that "somehow" got lost. Here's the story. Anyone who's followed this blog for a while knows that shortly after university I moved into an old, beat-up house on the corner of 108th and 108th with Allan Sampson, Ron Briscoe and Carrie Humphrey. Carrie moved out after a month, and so we christened the house "The Bleak House of Blahs," for we were all underemployed or unemployed, had no girlfriends and no prospects of rectifying either shortfall. Plus, there was a double machete murder at the donut shop a block away a day or two after we moved in. It was a dark time. However, it was also a time of great creative energy for all of us, and this energy often manifested itself in odd ways. One day, while shopping for something else altogether (probably comics at Warp One), I came across a keychain that had eight buttons. Each button would produce a Star Trek sound effect: the red alert siren, a photo torpedo firing, an intercom whistle, and so on. "I could make a great answering machine message with this!" I thought, and so I scripted a mock battle in which Captain Woods (i.e., me) couldn't answer "your comm signal" because I was in the middle of a battle right now, thanks very much. I wrote a script, then painstakingly recorded the message. I set up my record player (!) to play an authentic Star Trek music track (probably something by James Horner from Star Trek II or III), hit each keychain sound effect at the appropriate moment, and delivered my dialogue as melodramatically as I could. Coordinating the music, the sound effects and my own performance was quite a feat, and it took many takes to get everything just right, but in the end, I had produced what I felt was the ultimate Star Trek answering machine message. Now all I had to do was sit back and enjoy the astounded reactions of my callers. I believe the first person to call was my mom, and to my recollection she didn't react to the message at all, just left her message as if her son were normal. I guess she'd developed an immune response to my eccentricity. The next call was a wrong number, but at least it provoked a strong reaction. A group of drunken twentysomethings left me a message composed of mostly uproarious laughter. Success! EARL: Hey - wha - WHAT ARE YOU DOING? YOU FOOL! I was crushed. All that work...I didn't have the heart to recreate perfection. It would have been like Da Vinci painting the Mona Lisa again had it been lost in a fire. Instead, I allowed Jeff's re-recording to serve as the message for a while, then recorded something more conventional. These days, the story of creation and loss is just as valuable to me, if not more so, than the actual message itself. All art is ephemeral in some sense, and without Jeff's accidental destruction, I wouldn't have this wonderful story about those crazy days at the Bleak House of Blahs. And, as pictured above, I actually managed one of the intramural baseball teams at Leduc Junior High. I still have the score sheets kicking around somewhere. Despite my indifference (some would say "antipathy") to sports, I find myself drawn to baseball. It seems more civilized to me than other sports, for one thing; it seems as much a game of physics as anything. There's little physical contact (unless there's a brawl), and there's something appealing about the culture of baseball: the music, the association with hot summer days, popcorn, hot dogs, cold drinks. And it's a game that anyone can play - anyone with a bat, a ball, a glove and some forgiving friends. Jeff Shyluk and I played Earl Weaver Baseball on his Amiga during the waning days of our university careers. We created two teams: the Minions of Chaos and the Paladins of Order, based on characters we created (or stole) for a series of collaborative short stories we wrote on Ron Briscoe's Freedom BBS. Players such as Irrational Carrot and Beef Ball Moo squared off against Paramount Importance and Bottle Dropper at two ball fields Verlucci Gruond (yes, spelled exactly that way) and...and I can't remember the "good guy" field. Perhaps Jeff will assist. This all culminated in the End of the World Series, a real nail-biter of a contest, during which one certain homer was memorably foiled by the ridiculously high outfield wall of Verlucci Gruond. I screamed and yelled and my manager character onscreen did exactly the same, kicking virtual sand on the umpire. When that happened, Jeff and I almost went mad with laughter. Even now I sometimes get the urge to find a bat, a ball, a glove and a friend and waste an hour or two cracking wood against...against whatever baseballs are made of. I do understand, at least a little, why so many of my friends and family members enjoy sports. There's something beautiful about the human body in action the human mind calculating angles and vectors and velocities, interposing bat or stick in just the right spot at just the right moment. Perhaps it's just the angry side of sports that turns me off, the urge to win at all costs, to hurt others in the pursuit of something as abstract as a championship. When people play, everyone should win. Maybe that's naive, but that's the kind of sportsmanship I can get behind. 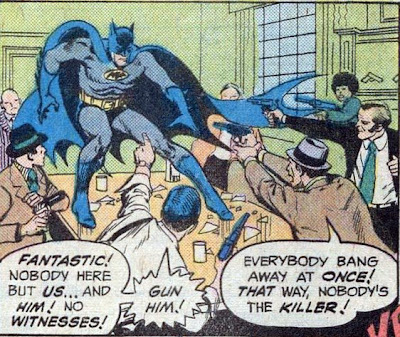 I'm no lawyer, but contrary to the hood's brazen assumption, wouldn't everyone be charged with murder or attempted murder in this scenario?